Home » Featured, People & Places » Are Guatemalan Laborers Entering Belize for Work? Why were hundreds of Guatemalan labourers at our Western Border crossing into Belize today? Well that’s the question everybody wants answered at this time. 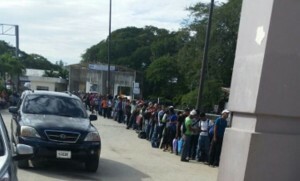 As you can see from this picture obtained by News Five, today hundreds of Guatemalan nationals were lined up to enter Belize. Reliable sources tell us that all of them came in on a one day pass, and all of them declared that they will be working in Belize, allegedly with the Santander Company which operates Green Tropics in the Cayo District. So what’s wrong with that picture? Well, it’s a rule of thumb in Belize that no jobs that can be done by Belizeans would be offered to foreigners. We’ve heard that repeatedly from no less than the Minister of Labour and Immigration Godwin Hulse. He wasn’t answering our calls today. Neither was Director of Immigration Maria Marin. We’ll keep following this story. Of course they are. But they are being given passports to make them Belizeans. They are soon-to-be newly minted Belizean citizens. When Ali grants them mortgages for their homes they will proudly vote “Viva UDP”. Somebody has to kick out the PUP cane growers. Funny thing is these labourers are on the wrong side of the border….. why?? What on earth! When will Belizeans who live in Belize take serious actions against this Government and any Government that comes into power?? This is foolishness! SO many poor Belizeans are in need of a little work and here they are, giving jobs to our bitterest opponents! Gush! I don’t curse but If I did I would. This is sick! Belizeans what will it take? Our rights are violated, people who are poor are getting violent because poverty and crime goes hand in hand. I personally know two individuals who have both a Guatemalan passport with a Guatemalan birth certificate and a Belizean Passport with Belizean birth certificates. Where do I report this? I am not surprise..Check d shrimp farms in southern Belize..they did the same thing..Belizeans get fired and they brought in foreigners..
1. Belizeans are lazy, and that is a fact. They want office work but don’t work towards it (with fourth form they want to be managers). Belizeans wont do farm work or dig drians for $30 a day. And we complain… We need to get educated on supply and demand studies. If we keep saying I have rights… well keep waiting for them.. meanwhile somebody else is doing the job. Easy as that. 2. Santander is owned by Guatemalans. 3. These last but critical is there are SEVERAL agreements between Santander and UDP.